Exposure to a range of carefully chosen, quality businesses provides diversity and protection from risk. By CLYDE ROSSOUW, portfolio manager and co-head of quality at Investec Asset Management. Half of the 21% return delivered by the FTSE/JSE All Share Index in 2017 came from its largest share, Naspers. We don’t own Naspers in both the Investec Opportunity and Cautious Managed funds. Our zero exposure has been a key question for a number of our clients, given that Naspers has been the significant driver of equity returns. Naspers’s dominance in our market reminds us of some of the previous market structures we’ve seen at the turn of the century. Those investors who were involved in the financial markets in 1999/2000 will remember the contribution that Dimension Data made to the South African stock market performance. Investors may also recall the substantial – over 80% – contribution Anglo American and BHP Billiton made to the South African market at the top of the commodity cycle over 2006-2008. The South African market is very narrow and is often driven by one or two holdings. The consumer staples, healthcare and technology sectors provide a fertile hunting ground for quality companies, primarily due to their ability to create barriers to entry. In South Africa, there is a dearth of technology and healthcare businesses, whereas these opportunities are in abundance across global markets. As investors are exposed to a narrow and concentrated opportunity set in South Africa, we believe that adding a quality offshore component to a South African portfolio provides complementary exposures. This forms an integral part of diversification. Aside from the complementary exposure benefit, we are finding superior-quality businesses offshore that have proven their ability to deliver high-quality profits, sustainable growth in earnings and cash flows, and high returns on invested capital (ROIC). We recognise the dynamic role many technology businesses are playing in shaping the world. To this end, our Investec Global Franchise Fund and the offshore vehicles of the Investec Opportunity and Cautious Managed funds, provide exposure to an array of higher-growth technology opportunities. This diversity of technology holdings ensures we avoid a single stock, single geography/jurisdiction approach where we are too exposed to regulatory risk in a particular market. We are not thematic investors. When we add any share to the portfolio, it has to meet certain quality criteria. The valuation needs to make sense; the company should have clear and strong secular drivers for growth (not seasonal or cyclical) and, importantly, generate cash. What the company decides to do with this cash is also of utmost importance. Capital allocation decisions should be value accretive. This is how we evaluate any business for inclusion in our portfolios. So which technology companies have a position in our portfolios? We have exposure to NetEase, the second largest manufacturer of games in online China, which is further globalising its footprint. It has a market cap that is a tenth of that of Tencent, but its revenue growth for the overall business has been around 30%. Most importantly for us, we can value the business on a free cash-flow yield basis as the business generates cash, and it currently trades on a valuation that is approximately half of that of Tencent. We own Paypal and Visa, two well-established businesses that are growing very rapidly. They have strong network effects and we can also value them in terms of their free cash-flow yields. The payments space is one of the areas Tencent is trying to grow, via Tenpay and Alipay, but they are still fledgling at this stage. In terms of exposure to e-commerce opportunities, Priceline is a key holding for us. The travel industry is fragmented and we see great growth opportunities for a market leader that dominates in that space. We have exposure to internet security, an area we are excited about as there are clear secular drivers of returns. Cyber attacks are on the rise and corporates are going to be forced to spend more to ensure their networks are sound and are able to withstand these attacks. Checkpoint Software Technologies has a large array of products and solutions that address the security needs of network clients. And lastly, in the software space we own Intuit, which provides a number of accounting solutions. Holding Naspers means having a concentrated exposure to Tencent, the Chinese internet company that operates within a state-dominated economy. China is growing very strongly, which has benefitted Tencent materially over the past few years. We believe Tencent is a quality business operating in an industry with strong secular and structural growth drivers. However, the valuation is extremely rich at this point in the cycle, providing us with an insufficient margin of safety should valuations normalise. So why do we currently not hold Naspers, a supposed discounted entry point to Tencent? Largely, we believe our process has captured and replicated various opportunities that Tencent and the Naspers “rump” offers, while most importantly, retaining control over our capital allocation decisions. Our diversified technology holdings therefore reflect an investment in innovative companies that are well placed to successfully navigate an ever-changing landscape. The information contained in this viewpoint release is intended primarily for journalists and should not be relied upon by private investors or any other persons to make financial decisions. All of the views expressed about the markets, securities or companies in this press comment accurately reflect the personal views of the individual fund manager (or team) named. While opinions stated are honestly held, they are not guarantees and should not be relied on. Investec Asset Management in the normal course of its activities as an international investment manager may already hold or intend to purchase or sell the stocks mentioned on behalf of its clients. The information or opinions provided should not be taken as specific advice on the merits of any investment decision. Telephone calls may be recorded for training and quality assurance purposes. Collective investment schemes are generally medium- to long-term investments and the manager gives no guarantee with respect to the capital or the return of the Fund. Investec Fund Managers SA (RF) (Pty) Ltd is registered under the CIS Control Act. 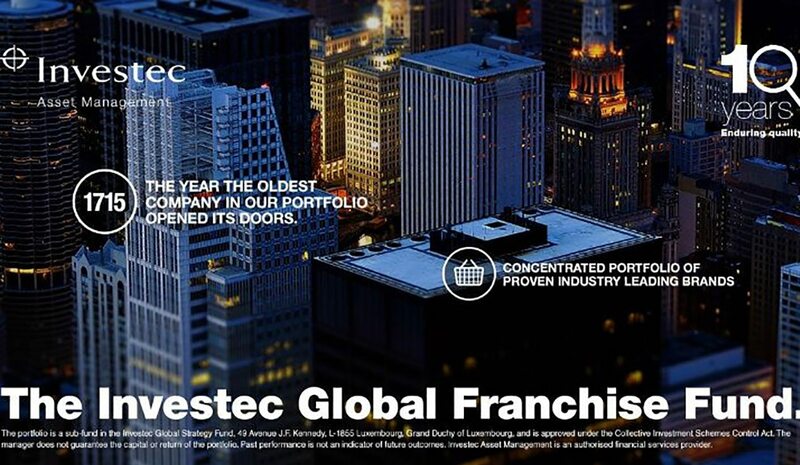 The Investec Global Franchise Fund is a sub-fund in the Investec Global Strategy Fund, 49 Avenue J.F. Kennedy, L-1855 Luxembourg, Grand Duchy of Luxembourg, and is approved under the Collective Investment Schemes Control Act. Investec Asset Management is an authorised financial services provider.